It's a friggin monsoon outside! It has never rained this much nonstop. I'm sad to see the cooler temps roll in :(. This mani just cheered me up looking at it though. From a few weeks ago, three coats of Pure Ice Heartbreaker, a sheer coral jelly with holo glitter. I used two coats of China Glaze Secret Peri-Wink-Le on the accent fingers then stamped the palm tree image from plate m28 with konad hot pink, it wasn't as crisp on the blue as I had hoped so sorry for the blur. 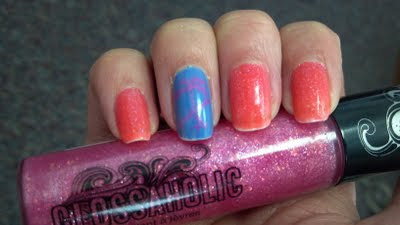 Pure ice is sold at Wal-Mart just like this delish Hard Candy Lip Gloss with FLAKIES! Hunkering down and clearing out the DVR tonight, you?